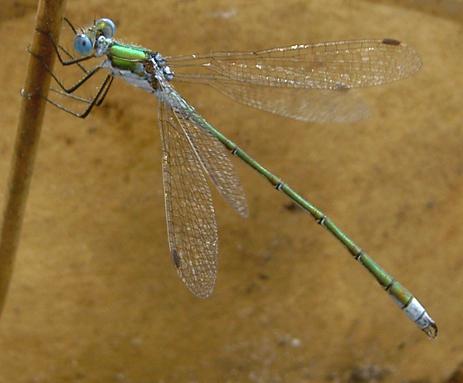 Emerald Damselfly is a nice name for this beatiful species, better then the Dutch name (common armor-damselfly) I think. 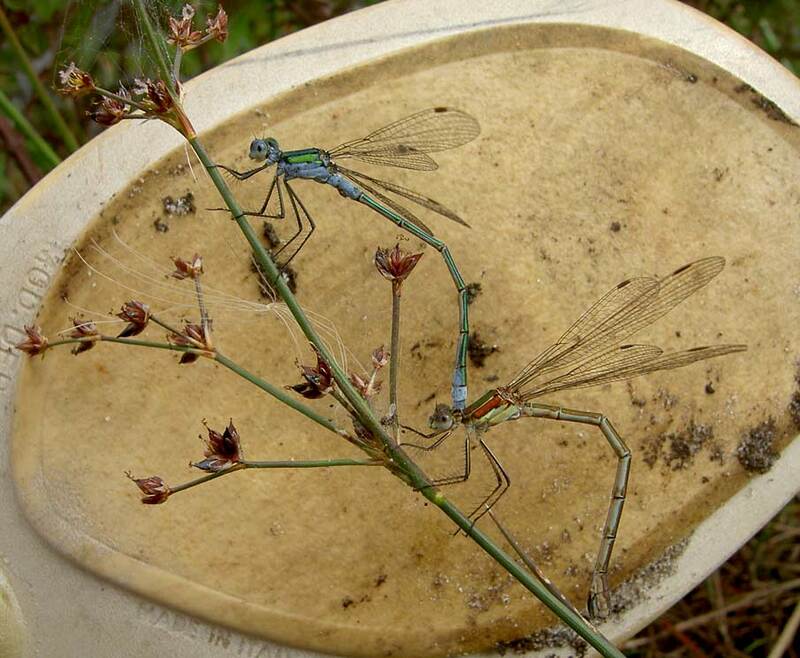 These damselflies stay in tandem while the female drills her eggs in rush stems (endofytic ovipositing). They move more and more down the stem until finally they may go under water. In that case the higher sitting male can help the female submerge again. This pair however laid there eggs over a dried out bank of a pool in the heather. In the time the eggs hatch the prolarva, which is very small and somewhat wormlike, may fall in the water which has come up again in autumn or spring, or even make several jumps (some centimeters far) on the dry land to reach the water. After reaching the water it normally changes after some minutes in to the normal nymph model. These photos are an exeption on my habit of making pictures which show the animals in as natural as possible surroundings. But as I had only my small Konica-Minolta G400 with me, which refuses to focus on these narrow little bodies between the many stems, I had to use the slipper of my girlfriend to get an even background. In a way I like this composition very much though, I think it has something of a classic Japanese drawing. Pity about the dirt on the sole..